If you’ve been eyeing a big, comfortable hatch for the city, we’re sure the Elite i20 is on your “to check” list. Even with the recent facelift, the fundamentals of this Hyundai has remained unchanged: it continues to be a no nonsense, well built, well equipped vehicle that pleases most and offends none. 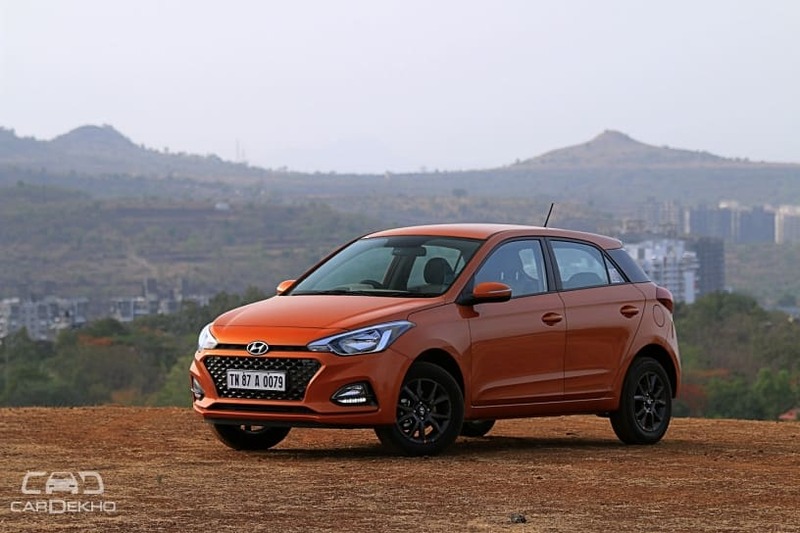 We aren’t expecting that to change with the Elite i20 CVT we have on test; we are to find out if the CVT has made the i20 a better city slicker than it already is. Hyundai refined the design of the Elite i20 earlier this year. But the finesse seems to shine through in the top-spec Asta (O) only. The car you see in pictures is the top-spec automatic variant, Asta, you can buy. And we’re sure you can tell, it doesn’t look as flashy and wow as the top-spec manual. That’s because there’s quite a lot that’s different. Starting with the face, the projector headlamps with daytime running lamps have been skipped. In its place are the usual reflector headlamps, which seem a bit bland now. You do get DRLs, but they underline the fog lamps now. The new bumper looks a touch more aggressive than before, and we think the chrome-less design does suit the i20’s sober character quite well. Speaking of chrome, that’s missing from the door handle. What’s also given a skip is the request sensor for keyless entry. The other immediately apparent change are the smaller wheels. Where the Asta (O) gets a swell-looking set of 16-inch wheels, the Asta has to make do with 15-inch wheels. We wish they weren’t finished in this gunmetal grey shade, though. The dark colour tends to make it look smaller than it actually is. The gloss black appliqué on the C-pillar, the LED-mimicking tail lamp and the new rear bumper look their usual best on the i20 Automatic as well. In case you’re wondering, there’s a only a tiny badge on the right fender that’ll let you know the car is an automatic. There are no other tell-tale signs. Step inside the cabin of the Elite i20 CVT, and it’s all too familiar. The well laid out dash, the easy-to-reach and use controls and the familiar cool blue backlighting makes the cabin a very comforting place to be in. Considering the automatic isn’t in the wow Asta (O) variant, there are a few misses that take a bit away from the experience. We’d have loved it if Hyundai threw in a total of three things to make the in-cabin experience a bit richer: A leather wrap for the steering, a gloss-black applique/silver outline for the gear lever, and auto up functionality for the driver side power window. The first two, although minor additions, go a long way in delivering Hyundai’s premium promise. The last one, well, we think is something that should be standard from the base version. Speaking of features that should be standard from base, can we please have a rear wiper, Hyundai? Save for these misses, we’ve got nothing to complain about. The quality levels are among the best in class, and the rest of the feature list doesn’t disappoint either. There’s a crisp 7.0-inch touchscreen with Android Auto and Apple CarPlay, automatic climate control with rear AC vents and steering-mounted audio controls. Some feel-good features are on offer too, including the electrically folding rear view mirror and the theatre-dimming effect for the instrument cluster when you switch the car off. The Asta variant here gets an MID too, that reads out basics such as speed, trip details, distance to empty, and efficiency. It doesn’t look as fantastic as Hyundai’s “supervision cluster”, but it gets the job done. For context, the cabin isn’t as wide as its chief competitor, the Maruti Suzuki Baleno, nor does it have as much knee room. But it does have marginally better headroom. Boot space, rated at 328 litres, isn’t class-leading either but again, it’s enough. It happily swallowed a week’s worth of luggage for two people, and a few camera and tripod bags. Powering the Elite i20 CVT is Hyundai’s tried and tested 1.2-litre, four-cylinder petrol engine. The sheer refinement of this motor is astonishing. There’s no under-bonnet insulation, despite which the cabin is a pin-drop silent place. The few times you’d hear the engine include a cold start and when you’re absolutely flogging the engine for every ounce of life it’s got. Don’t do that. Just, don’t do that. The Elite i20 CVT simply isn’t made for it. The 0-100kmph dash takes a super leisurely 16.18 seconds. To put some context to the numbers, it’s about 0.13 seconds quicker than the Tiago AMT we tested a while back. Yep, there’s no denying it - it’s not particularly quick or exciting. But, WE LOVE IT! And that’s down to the CVT. We know you’re probably rolling your eyes thinking how a whiny CVT can be lovable. But snag a test drive, and you will quickly know why. It’s among the smoothest CVTs we’ve tested, and it’s perfectly suited for its intended purpose. And that, is commuting inside the city. It’s the ease of driving that really seals the deal for us. Unlike old-school CVTs where you have to stomp the throttle to even make slight progress, you can feather the accelerator in the Elite i20. There’s no guesswork involved at all, you exactly know how much the car will accelerate when you step on the gas. It picks up minor modulations in the pedal input nicely too. For instance, if you need slightly more power to make a small overtake, but not all of it, the transmission gives you exactly that. Does it ever seem unpolished? Well, yes. It does. In two cases: inclines and quick highway overtakes. On really steep inclines, the gearbox seems a bit confused. So it ends up redlining the engine and making quite a racket. The thing is, the Elite i20’s engine doesn’t really have much to offer at redline rpm, so it seems a bit counter-productive. Consequences are similar on the highway. If you dance out of your lane and slam the accelerator pedal, you get more noise than progress. Sure, you could shift to manual and take over shifting duties yourself. But trying to exploit the 6 preset ratios is quite pointless. It isn’t any quicker, so might as well let the ‘box do its own thing. The mantra with this car is to take it easy. When you do, you’d find yourself relaxed, happily tapping away to the music. If it’s this convenience you’re looking for, and nothing else, it doesn’t really get any better than this. It’s not all that heavy on the pocket either: when driven sanely, it returned a respectable 12.16kmpl inside the city and 15.99kmpl on the highways. From 100-0kmph, the Elite i20 took 42.98 metres - that’s 0.10 metres less compared to the Baleno RS (43.08 metres) that’s equipped with four disc brakes. Clearly, performance isn’t an issue. But the feel on the pedal leaves a lot to be desired. There’s no issue with braking force - the car stops in an acceptable distance. But there’s a learning curve to the pedal’s travel and feel. Hyundai should’ve dialled in a sharper initial bite. Much like its manual counterpart, the i20 CVT makes light of broken roads. The suspension doesn’t make a sound while tackling bad roads, potholes and the rough stuff in general. The tyres too remain silent whether you’re at highway speeds or chucking it in a corner with some gusto. Talking of corners, the Elite doesn’t really mind a set of twisties. The steering, though familiarly light, doesn’t really need corrections to hold its line. It’s just the right weight on the highway too, we’d want it to do nothing more. And, unlike old Hyundais, the Elite i20 remains steady at highway speeds. Yes, you do feel some vertical movement in the rear bench at triple-digit speeds, but it does get better with occupants and luggage. Since the Elite i20 automatic is not available in the top-spec Asta (O) variant, it has to make to with dual airbags and anti-lock brakes with EBD. Surprisingly, Hyundai doesn’t offer ISOFIX child-seat mounts on any variants save for the fully-loaded variant. If you want an automatic Elite i20, you get to choose between two variants: Magna and Asta. In both cases, it commands a premium of Rs 1.05 lakh over its manual counterpart. Let’s get this out of the way - it should’ve been offered in the top-spec Asta (O). If not, it should’ve at least borrowed a few must-have features such as a rear wiper, push-button start and keyless entry from the top-spec model. Considering the price runs north of Rs 9 lakh, the lack of these features do raise an eyebrow. The second bugbear is the less-than-ideal brake pedal feel. Like we said, there’s no issue with the braking potency at all, it’s the feel that needs fixing. That aside, the Elite i20 CVT won’t give you a reason to complain. It does just one thing: add convenience to an already capable package. And, that’s all it needed to do. It’s a fuss-free commuter that ensures you’re relaxed and smiling at the end of that dreaded drive back home from office.